The race for remaining outfielders is heating up in Nashville, with Josh Hamilton and Shane Victorino both moving closer to long-term deals, and one wild blockbuster rumor sparking a million tweets. Still, there may be some smoke with that fire. Upton has been linked to trade rumors for weeks this offseason, with Arizona carrying four starting-caliber outfielders and looking for a front-line starting pitcher. The Phillies have some starting pitching depth, they need outfield help, and Lee’s owed $87 million for the rest of his contract, a reasonable expenditure for a pitcher of his stature, but for the fact the Phillies have several other huge contracts on the roster, too. The stumbling blocks are many: Philly would probably have to eat a bunch of Lee’s contract or else the deal wouldn’t be attractive to the D-backs; Arizona’s top priority remains a young shortstop with a big upside; and a third team might be needed to make it all work. Whether it’s Texas jumping in with Elvis Andrus in a three-way trade, Lee staying put, or some other iteration of events, Upton’s pursuit from multiple teams (including Cleveland and Texas) could bear fruit before long. Given Upton’s enormous talent, and his contract over the next three years being ostensibly identical to Shane Victorino’s, you have to figure someone will want to take the plunge. The Red Sox pounced on Victorino, at a high price: Three years, $38 million. Boston will play him in right field, at least for year one of the contract, with the defensively limited Jonny Gomes handling the limited real estate in left and Jacoby Ellsbury in the final year of his contract back in center. Baseball is very much a what-have-you-done-for-me-lately business, which is what makes the size of the reported offer so interesting. 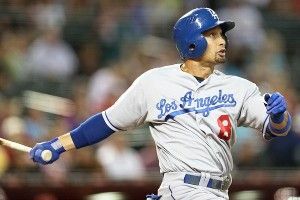 From 2008 through 2011, Victorino ranked as the 21st-most valuable position player in baseball, combining blazing speed with solid extra-base power, good center-field defense, and plus on-base skills. His 2011 season was especially huge: .279/.355/.491, with 27 doubles, 16 triples, and 17 homers in 132 games, and career highs in slugging and WAR. That power outburst looks like an outlier compared to the rest of his career, though, with Victorino’s numbers nose-diving to .255/.321/.383. So did the Red Sox get the 6-win player of 2011, or the 3-win player of 2012? If it’s the latter, Victorino’s age (32) and his speed-based skill set make him a regression risk over the life of the contract. On the other hand, the Sox run a money factory; even with Victorino, their salary for the entire roster shouldn’t go much beyond $120 million, and Victorino offers a much cheaper option than Michael Bourn or Josh Hamilton. He also ensures that the Sox don’t have to trade one of their premium prospects to plug that outfield hole. Given the team’s time frame for contending probably kicks in after a reloading year in 2013, we’re probably talking about a mild overpay for a rich team on a stopgap player who won’t kill you. You’re not getting a parade, but you can probably cancel the witch hunt, too. Reports have Hamilton mulling a four-year offer to re-sign with the Rangers. Though dollar details aren’t known, the total dollar amount on the deal would likely approach $100 million. This would be a shorter deal than Hamilton had been seeking, but also a more logical one for the Rangers, given Hamilton’s injuries, advancing age (he turns 32 in May), liberal interpretation of the strike zone, fading ability to play center field every day, and somewhat checkered off-field history. The deal isn’t done, and the Mariners are said to be trying to woo Hamilton at the 11th hour. But the Rangers appear the favorites to keep their star outfielder in town. Whether that’s a wise decision depends on Hamilton’s many variables, but also on the rest of the Rangers’ plan. The Dodgers are believed to be the front-runners for Zack Greinke, which would leave the Rangers without a potential ace, but also ensure they don’t pay $150 million-plus for his services. If Texas’s plan B consists of something like a trade with the Rays for James Shields or Jeremy Hellickson, the payroll math would start to make a lot of sense. So, too, could signing a potentially undervalued starter like Edwin Jackson. Many scenarios, many potential twists, many of which could become clearer on Day 3.